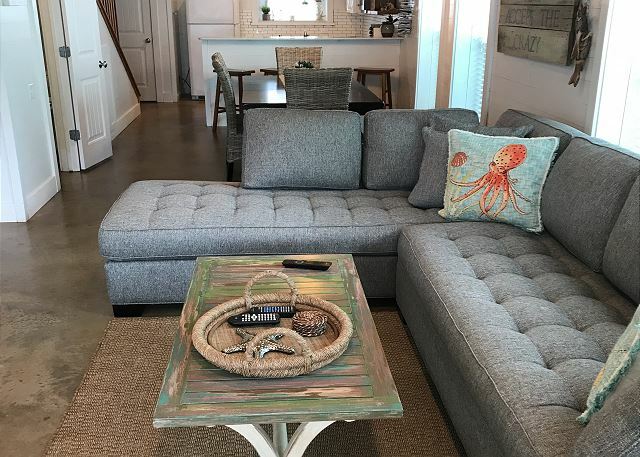 The open living area boasts a large plush, sectional seating area and accent chair with a flat screen TV, cable and Wifi. The dining area has a table with seating for 6 consisting of 4 chairs and a bench. Extra seating is available for 4 at the bar. 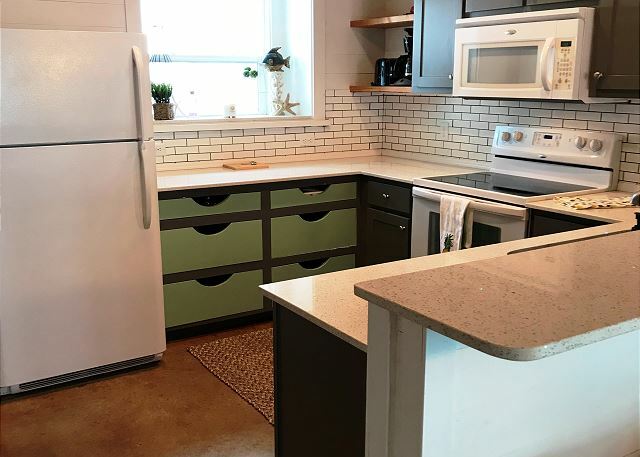 The full kitchen is equipped with appliances cookware, pantry and plenty of counterspace to accommodate your cooking needs. 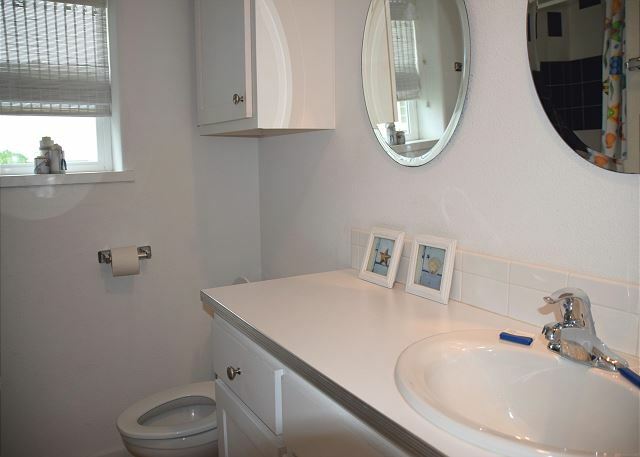 There is also a half bath under the stairwell. 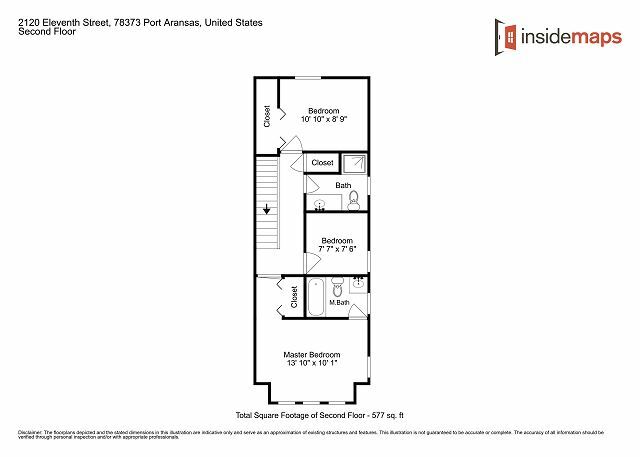 Upstairs you will find the master bedroom, which has a Queen size bed, wall mounted TV, accent chair and an en-suite bathroom with a tub/shower combination unit. 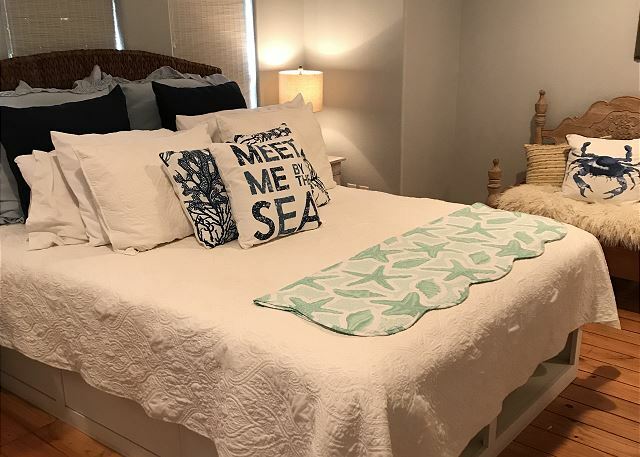 Guest room 2 (BR2) has a set of Full bunk beds, Guest room 3(BR3) has a Queen bed, wall mounted TV and closet for your beach attire. The guest rooms share a hall bathroom which has a stand up shower. 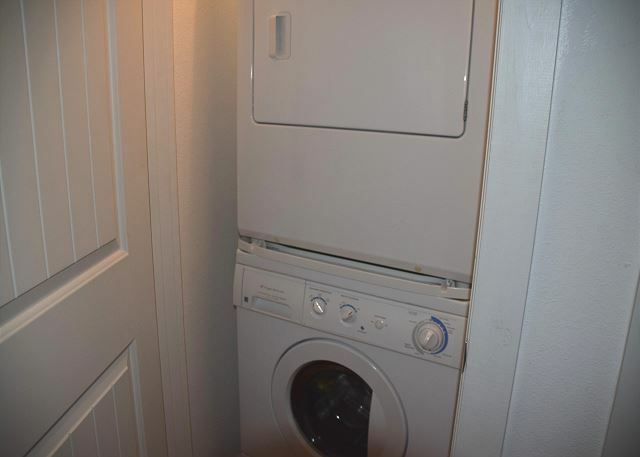 The washer/dryer unit is tucked neatly in the hall closet upstairs. 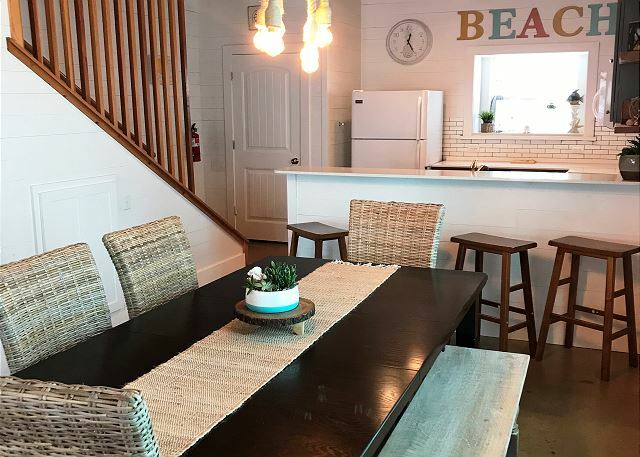 The Commons at Seashell is a great spot for renting one unit for up to 8 people or multiple units for up to 90 people for family reunions, retreats, and gathering of friends. 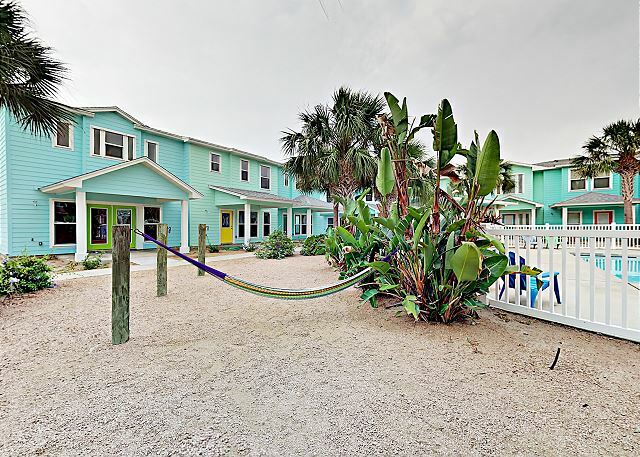 There is a large shared pool, hammocks for relaxing, picnic tables and charcoal grills for outdoor cookouts under the shade of a cabana in the center of the units. 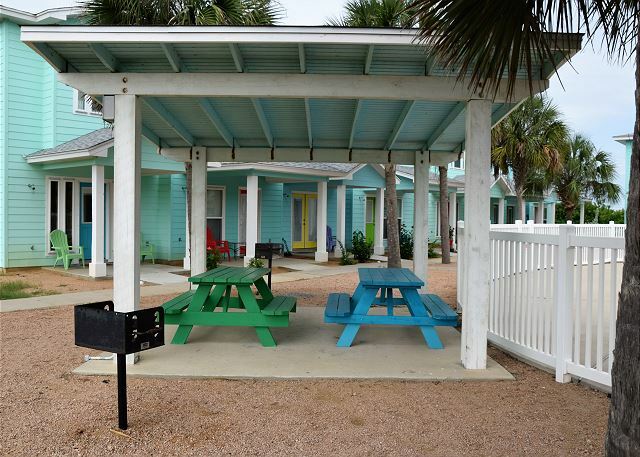 Each unit has an outdoor shower to rinse off after a day of playing in the sand. 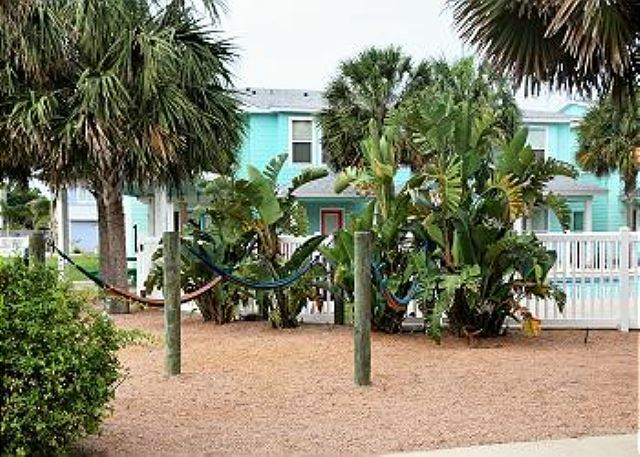 It's an easy walk or fun golf cart ride to the beach. Nice place. Everything was in good working order, and was clean. The girls (my wife, my daughter and her friend) all went on about how cutely decorated the place is. We are happy to hear that you had a great stay. Please come back soon! Thank you for your review. 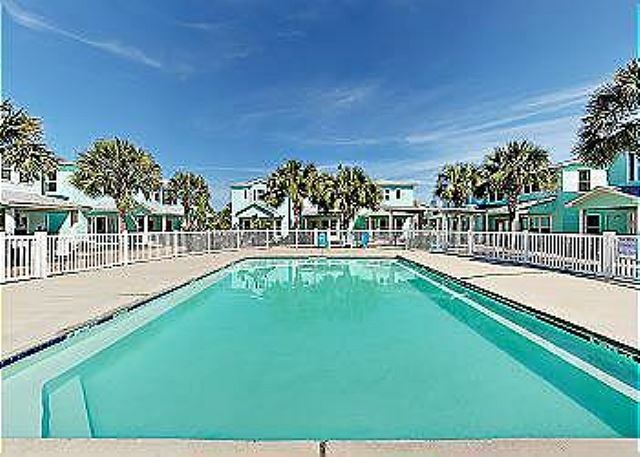 Beautiful condo, great location, and the perfect place to stay for a family beach vacation! Thank you so much, we are happy you enjoyed your stay with us. Our rental was adorable on the inside and clean. It was perfect for us. Everyone slept well. We loved the shuffle board! We were glad to have a golf cart to get to the beach and run around. The first night, there were some very loud guests in the common/pool area after 10 pm. When we emailed management, they responded immediately. Good stay! We had a wonderful time. The house, golf cart and fishing were exceptional. It's nice to see all the hard work taking place since the storm. see you again in a few weeks! We all had a great time and had everything we needed at the condo. It was clean, comfortable, and a great location. We only stayed the weekend, but next time we will stay longer. overall the experience was good. we had a couple of issues. one bathrooms were very small. second the bed was very uncomfortable. I am glad you enjoyed your stay, I am just making sure you understand the rating system, 1-5 stars, with 1 being the worst and 5 being the best? did you mean to give the unit a better rating than a 1? we will relay this information to the owners and make sure we correct some of the issues. The condo was a delight! It was roomy, clean and very comfortable. It had everything we needed for our stay. Being able to have a late check out was an added bonus! Thank you for an enjoyable stay! Love it ... had a great time and the location was perfect for beach and night life activities. Close to the beach. Nice property. Can get a bit loud. 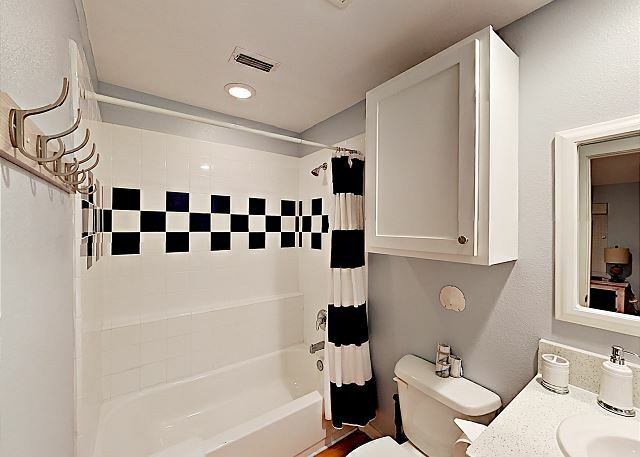 The unit is just as described and has a well equipped kitchen. Small soap and shampoo in the bathrooms is a nice touch for those who may forget those items! The pool was a bit cloudy but it was otherwise very clean. It seemed to get a lot of use and The Commons is only partially finished. With all units facing each other in a square with the pool and grill area in the center and no other outside area, evening and nights got pretty loud. For families with small children like us it made it hard at bedtime. 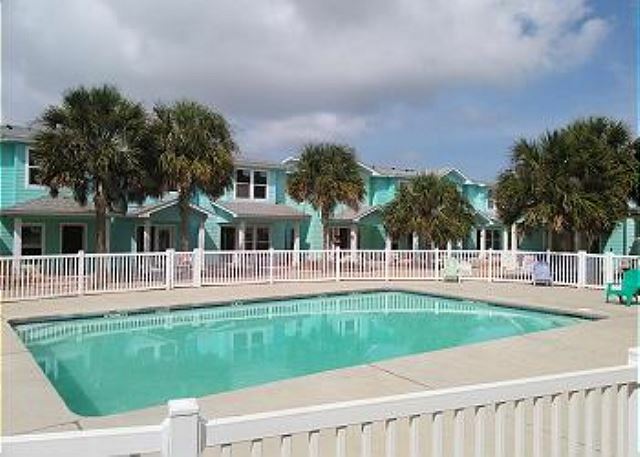 The neighboring condos have a pool directly behind as well. Sebastian at Life in Paradise was very friendly and helpful. Clean and nicely furnished. Worked well for us. Had a great time. Only thing we found wrong was the neighbors where up till 3am every night. The noise was horrible. They need an onsite manager to stop this. 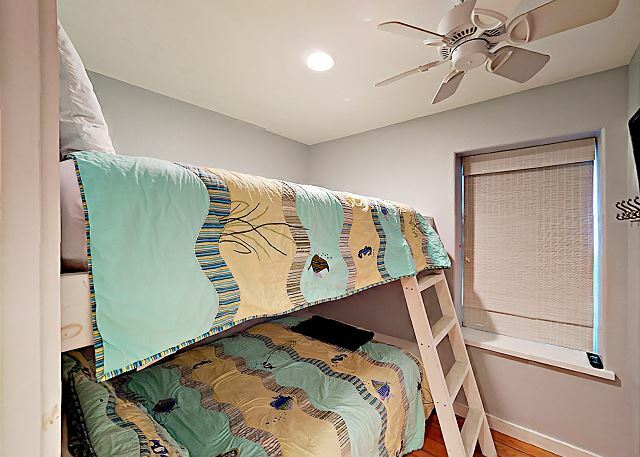 The only other thing was the beds where not the best comfort but all else was perfect. 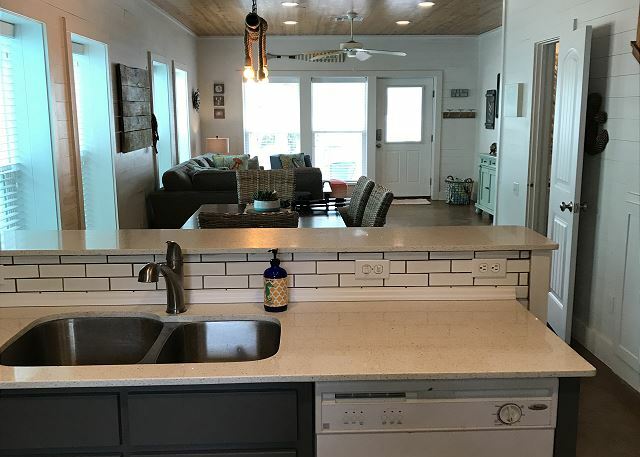 we had a great time at this vacation rental. It was a great location with everything near by. We love this this Island. Great shops, restaurants, great beach. This is the second time we have stayed at the Commons and we loved it. Lots of space, pool is great. We used the grills. We will go back. Owners provided everything for all our needs. would only recommend the unit owners consider some form of pool heating or a solar cover may be enough to heat and maintain heat so the pool could be used by your "Winter Texans". 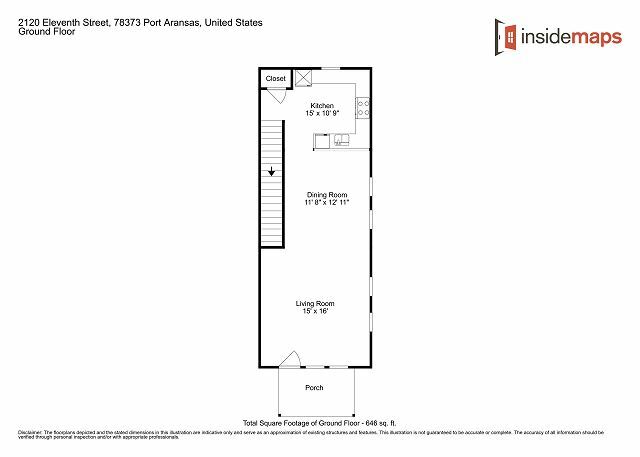 This would make the units more attractive to renters. Thankyou so much for the input.. We will be sure and give this information to the owners.. Have a wonderful summer and we look forward to seeing you next winter.. 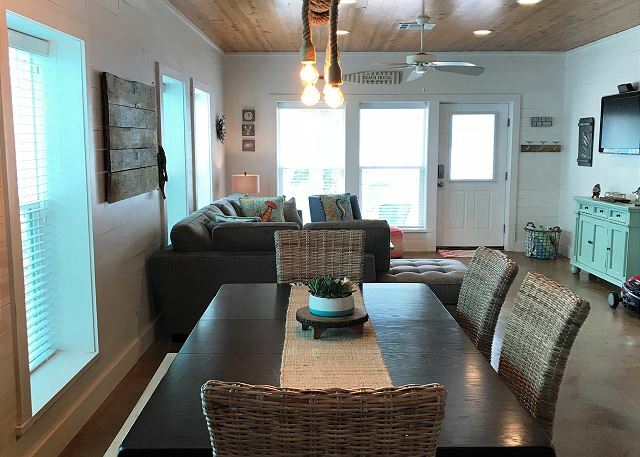 I selected this location based on good reviews and the pictures which show a cute brightly colored beach townhouse, but I was nervous because we all know that pictures and reviews can be deceiving. I booked for a friend trip and was honestly nervous I was going to get blamed for renting a dud, a place not close enough to the beach. I shouldn't have been nervous at all! My friends and i were so impressed by this place! 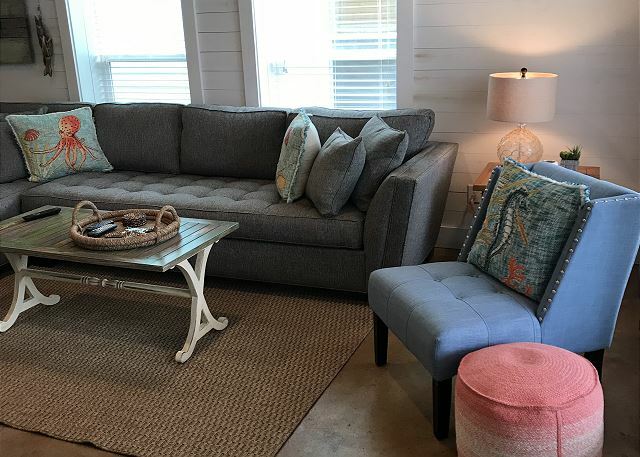 It is adorable, the decorations inside are updated and cute - no old floral couches here! The space really has been beautifully done. 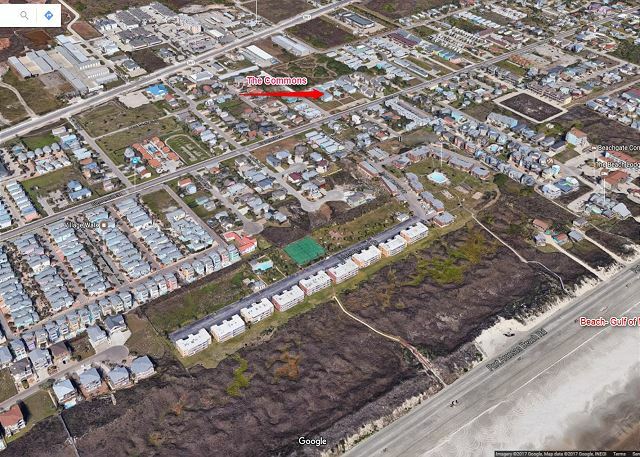 As for distance from the beach, it's walking distance, but more importantly golf cart distance (definitely rent one). 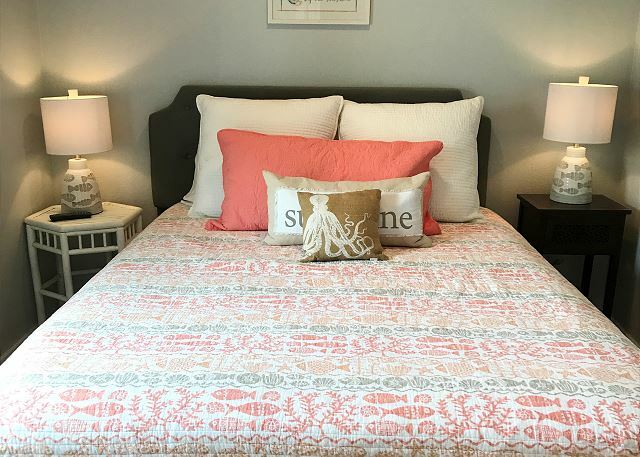 The house was clean, and the cable worked, there are puzzles for those rainy beach days, and the beds are comfy. The shower in our unit did leak a little down onto the first floor, but the landlord was quick to answer the phone anytime she had a problem or question. Stay here!! You will not regret it! Also, did I mention the amazing peaceful hammocks? Hello, We are glad you enjoyed your stay. Thank you for letting us know the shower was leaking. It is getting fixed. Hope to see you again. We stayed five days at the Commons and enjoyed every minute. The condo was well maintained and extremely comfortable for 6 people, two adults and four teenage girls. The pool was clean and a great option when we were not at the beach. The beach was a short walk across the street and a short drive from Access Rd 1. We are very glad you enjoyed your stay. Thank you for staying with Life In Paradise. We are glad you enjoyed your stay. We hope to see you again soon! We enjoyed our stay at the Commons. The condo was very comfortable and well appointed. Kitchen had everything you could need. Only suggestion would be to have condo owners consider to install solar heater on pool since very few condos do, and it would make them more marketable, at little cost. 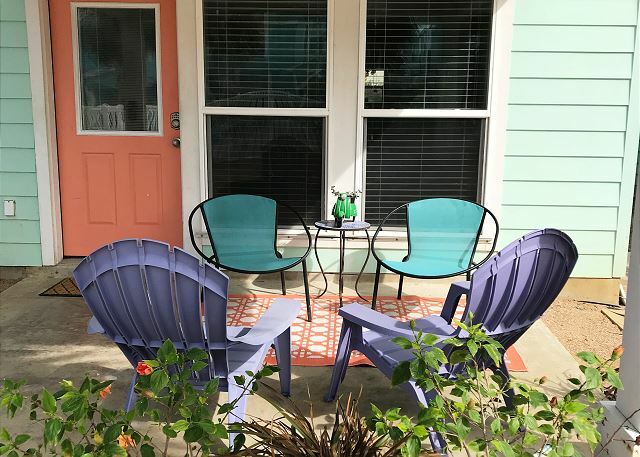 New owners,fantastic!-great amenities, crock pot,dressers,new iron,ironing board,vacuum, great dcor not over done,great unit for a Winter Texan 3 month rental.Stephanie was great & very helpful so was Life in Paradise Rental Co.